It was October and a beautiful day in Austin, Texas, when a friend of mine and I decided we’d head to Dogtoberfest and enjoy a glass of wine at my favorite restaurant. She brought her beautiful golden retriever, because, well it was a Dog Fest. And me, not being a dog person, managed to dodge dog bowls and the four-leggeds that were everywhere. We finally landed on the patio of an upscale wine bar and I was ready to settle in for an enjoyable afternoon with my friend. From our table, we had a clear view of the stage, where the loud announcer bellowed out the words, “Dog Parade”! Mortified, I looked at my friend in disbelief. She could barely keep from spitting her wine out she laughed so hard. We witnessed everything from weiner dogs dressed as hot dogs, to a giant dalmatian the size of a small horse, posing as a Chic-Fil-A Dog, claiming “Eat More Chikn”. About that time I felt something furry rub up against my leg causing me to jump sky high in my chair. 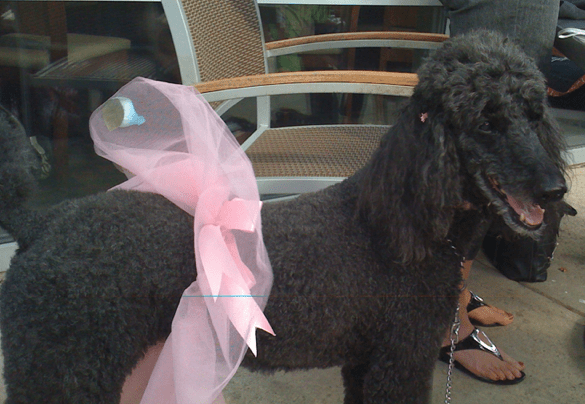 I turned around only to come face to face with this giant poodle donning a pink tutu. As I recall, I don’t think we made contact. It would be months until I would meet a sweet beagle that a friend of mine had just adopted. He was meek and had a mild temperament. We became buds. The beagle would stay with me from time to time when his dad needed to travel. And I began to change. It was just a matter of time before I longed for a dog of my own. My heart had changed. I was ready to begin the adoption process and I knew exactly where to go to find my beagle, having seen the rescue group at Dogtoberfest. So if you’re thinking that people can’t change, think again. The words in Ezekiel are true. God gave me a new heart. He changed the way I saw dogs, allowing me to experience the unconditional love of dogs first hand. My heart of stone was softened and I was given a heart of flesh. A heart for dogs. Clean the messes from the carpet? Absolutely. Kisses on the face? Bring ’em on. Snuggle with me in bed? Let’s go. Need to get up in the middle of the night? I’m there. Clearly, I’m not ready for a little human in my life. But a dog is close enough and I’m good with that.